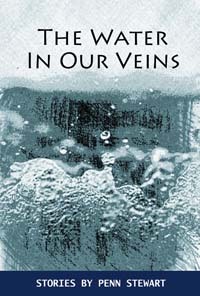 Just released from Big Wonderful Press, The Water in Our Veins is Penn Stewart's first collection of short stories. Combining flash fiction and traditional length stories, this group of tales range from the tragic to the absurd. Each one lands in the reader’s soul as Stewart explores humanity and what it means to be human. Stewart pursues every path to plumb the depths of hischaracter’s inner lives. We see the foundational strength of love and the taxation it imposes. We see all the bonds of family, generational conflict, and responsibility. Regular people laid bare by tragedy and time but buoyed by memory doubling back and carrying hope. These dazzling stories break but mend your heart even stronger. I loved every moment spent in this world. In prose as tight as lyrics, Penn Stewart observes with penetrating acuity the numerous ways we mess up but also save our lives as the earth shifts over and over again. Available now at Amazon or on the publisher's Square Up page.